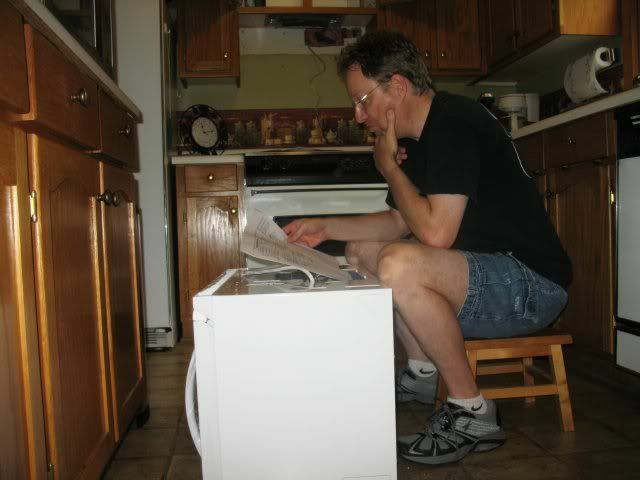 In our ongoing efforts to make our house more saleable, Steve installed an over-the-stove microwave this week. Although we knew that one little ol' microwave would not make or break a sale, it would mean that we could remove the Huge, Gawky, Gigantic Black Box of a Microwave that we've had on the counter. And doing that would free up a lot of counter space. 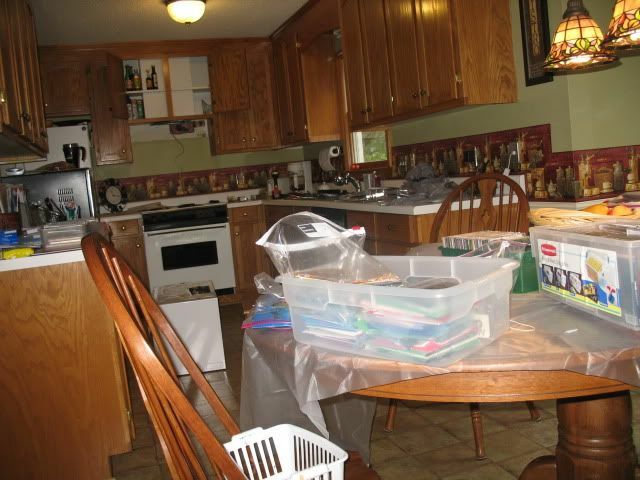 Here is the old kitchen look. Please note, if you will, the aforementioned Huge, Gawky, Gigantic Black Box of a Microwave and accompanying junk, er, necessary items taking up half of one counter. Now look at the difference! Pretty, cool huh? And here is where I must insert a word about my multi talented husband. He took a look at the light/exhaust fan unit that was above the stove which had to be ripped out, and he pondered the issues of getting electricity in the cupboard above the stove in order to plug the new microwave in, and he thought about the challenges of getting a heavy microwave lifted up and mounted on the wall above the stove (all things that would have made me run away in horror) and he said, "That shouldn't be too bad of a job." He said the same thing when he was contemplating our shower in the master bath a year ago and was preparing to install a glass shower door to replace the shower curtain. "That shouldn't be too bad of a job." Yeah, it's not too bad of a job if you're massively talented in doing home improvements like he is. But I digress. Back to the story in pictures we go. 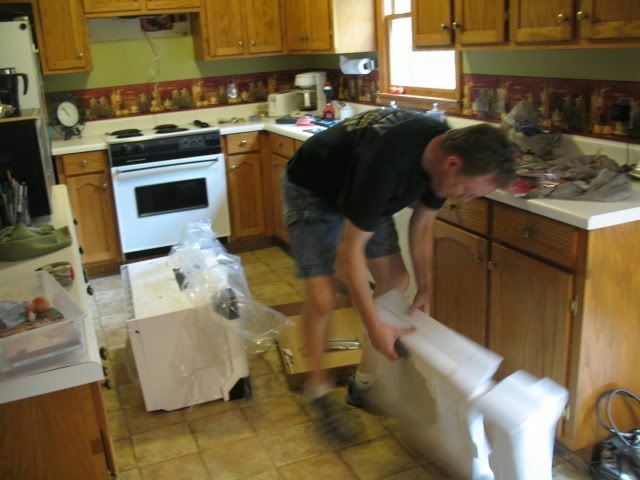 Here is the Brilliant Home Repair Man unpacking the exciting new microwave. 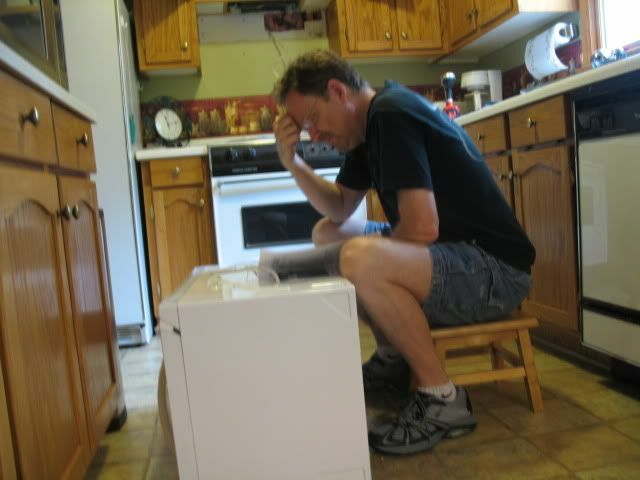 And here is the Brilliant Home Repair Man pondering the installation directions. And here is where I asked the Brilliant Home Repair Man to change his pose so that he would more closely resemble The Thinker. He looked at me and said, "You don't need me to take off my clothes, do you?" (Since of course, The Thinker Guy is a bit nekkid.) I said, "No, I think it would be okay for you to leave your clothes on." 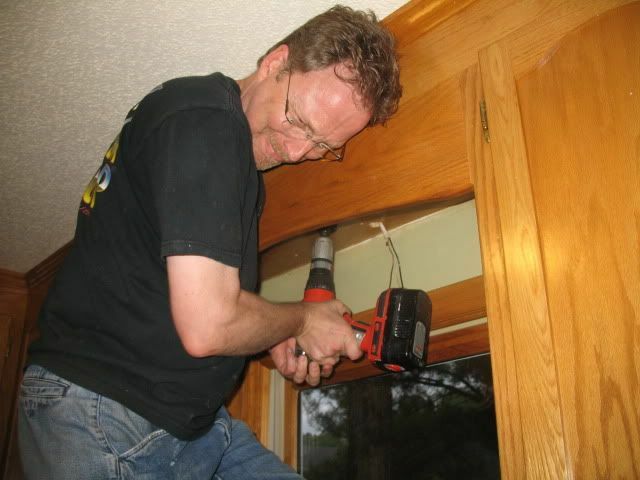 While the Brilliant Home Repair Man did his Brilliant Home Repairs, his Brilliant Wife and Daughter worked on their own Personal Home Projects. I got going on some further sorting duties which I am attempting to get finished before we start packing for real. Sarah took everything out of the TV cabinet and started sorting through videos and DVDs and deciding which ones to give away and which ones to pack. We also thought it would be good to change out the burners in the stove since they were about twenty years old and all crookedy. This "feature" caused the making of certain things like omelets to be a study in patience and creativity as we had to learn how to pick up the pan at exactly the right time and swirl the eggs in the opposite direction of the downhill flow. Did that make any sense? 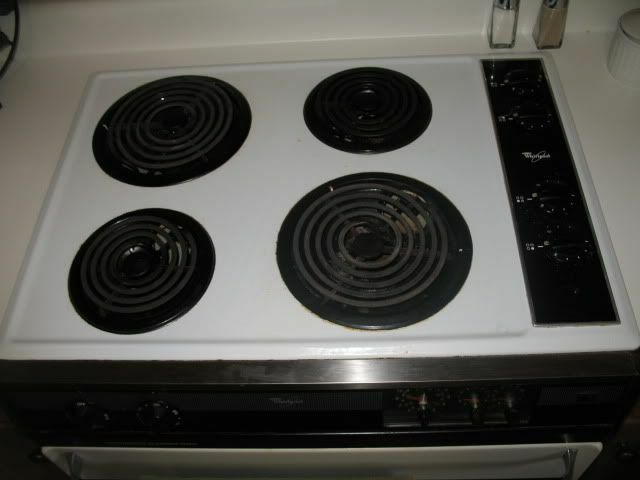 If you've ever cooked on a crookedy burner than I know you understand. You are my Crookedy Burner Pals! Here are the old burners in all of their crookedyness. And the new burners. Ta-da! Steve cooked an omelet the next morning and he said that it was quite disconcerting for him to put the eggs in the pan and just watch them sit there calmly and obediently, in a state of complete untiltedness. He hardly knew what to do with himself since he was so used to assisting his omelets through the cooking process by scientifically thought out and empirically tested tilting methods. It's the simple things that make life (and omelets) so good. Q. Where does Snowy go when you travel out of town? A. In the past, we've taken Snowy with us, but it gets to be a bit complicated--for him, and for us. So we've found a kennel nearby that he seems pretty happy at; whenever we pick him up, he always seems calm and contented. We'll take him in tonight (since we'll leave for Florida before it opens tomorrow) and he'll stay till Wednesday morning. This will the longest he's been apart from us but I think he'll be fine. He no doubt enjoys the social, yappy interaction with all the other dogs. Q. How does Sarah feel about the Manteo area? A. She really loves it. She seems to find the thought of living on an island exciting and of course, she is impressed with the loveliness of the surroundings. Sarah is the kind of gal that finds the good in just about everything and she's finding plenty of good in Manteo! Wow .. Becky ... that was a great entry. I think that you and Steve really missed out on an opportunity during these past nine months of job seeking. Do you actually know how many people would LOVE to have a trustworthy, talented, can do most anything man do all those handyman jobs around their homes? You know the ones -- not major jobs like sheetrock, installing windows, etc., but things like installing fans, microwaves, etc.? I can tell you are very thankful to have such a great handyman ... and I don't blame you! The kitchen looks great!! Becky, I am in awe of your kitchen! I would LOVE that much cabinet space! Oh and I was thinking about putting wallpaper border along the counter like you guys have. My hubby wasn't too thrilled about the idea because he has never seen that before. Now I have the perfect picture to show him! I just love reading your entries. Looks like I missed some "drama". I'm sorry you had some people criticize you. It's not right to judge others, you have every right to write about anything you want on "your" blog! I will pray that everything works out for you...selling your home in Smithfield and buying the perfect house in Manteo. I am a fellow "Crookedy Burner Pal"! 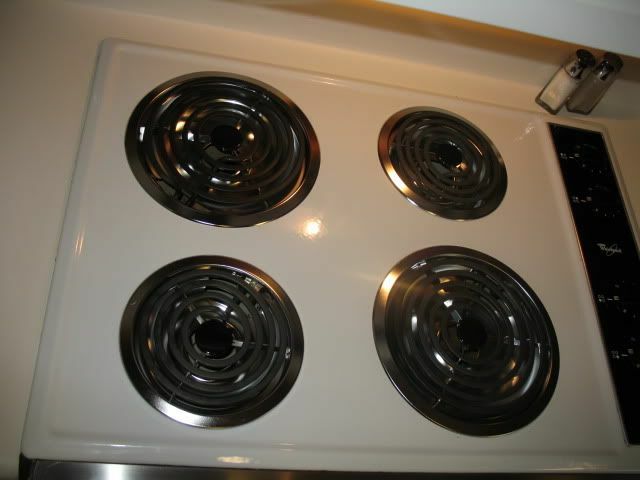 I purposely do not use my front right burner because of it's crooked-ness! I had no idea you could buy new burners! I knew about the "thingy's" under the burners but not the burner's themselves...where did you get them and how much were they? I would love to look in to new non-crooked-y burners! 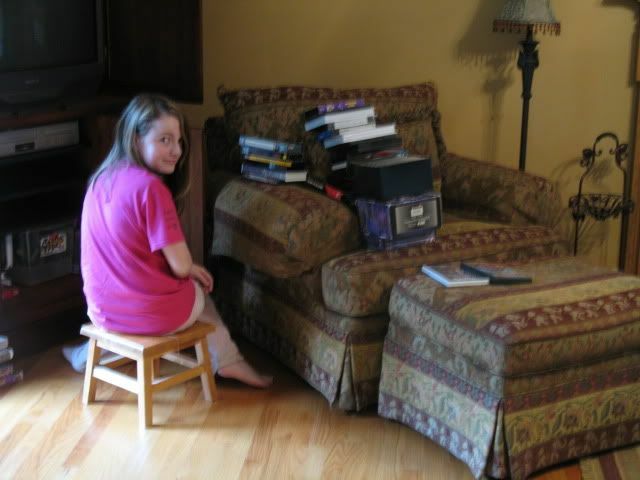 Hi Becky: I am a lurker de-lurking. I have a helpful hint for your packing. Most people use newspapers for packing to protect from breaking. I work for a printing company that prints newspapers and we sell what we call "end rolls". That is newspaper that has not been printed on yet. It is paper left on the roll that isn't big enough to put back on the press. It is great because nothing has to be washed after unpacking. It is not my stove burners that tilt - it is the floor in my 80 year old house that slopes - and I COMPLETELY understand the swirling of eggs AND melted butter and the changing position of pieces of chicken when frying (some are in the shallow end and some are in the deep end). By the way, you are blessed with that handyman husband of yours. 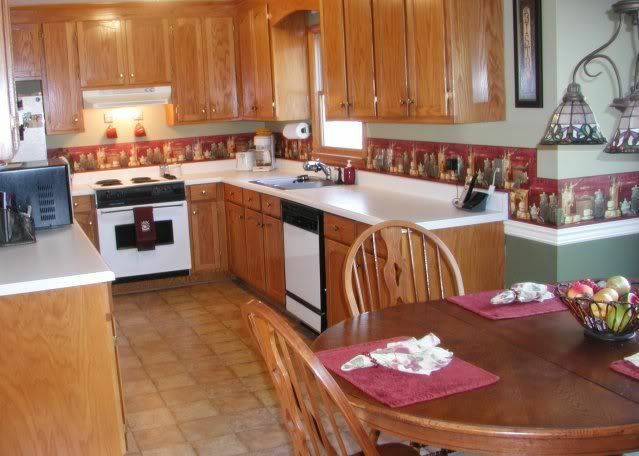 It is amazing what a few minor details will do to spruce up the place - your kitchen looks wonderful. Have a safe journey and I am sure Snowy will enjoy his "vacation" also - he probably justs wows them all with his cuteness! How could he not. I am not surprised Sarah loves Manteo and its surroundings - she is such a creative and senstive spirit that she must feel at home in some of the best of God's natural beauty. This could inspire even more lovely writings by Sarah. Okay, here's another idea - photos by Becky, writings by Sarah to accompany them - a different generational perspective on the same scene or object! Could be interesting. I think this move is going to be packed full of new opportunities and adventures for all of you. Are there any concerns about hurricanes in Monteo? 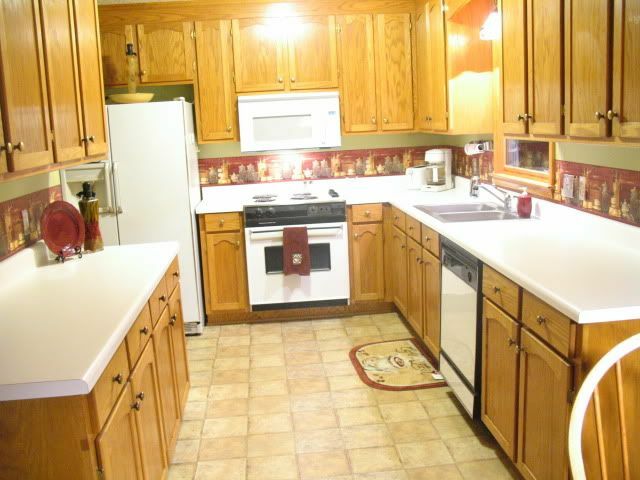 Kitchen looks so much better with the cleared counter and the overhead microwave. Good job! Well, when we can back to the kitchen after dinner, the bottom of the butter tub was melted and there was butter EVERYWHERE!!! It was not much fun to clean up! Can't remember if or how much I've written about our summer project... fixing the parsonage for the new Pastor which "we" (Preschool's church) got the first of July. Lots of parishioners have spent the last three months completely redoing the whole house. and I have to admit it is amazing (to me) to see how many "handy mans" we have. They did all the electricity and plumbing, and assembling all the new kitchen cabinets, including positioning a microwave over the stove. They also trimmed all the trees. The whole house had to be disinfected with bleach and Kilz before painting... several coats for each room!! I bet they have twenty different kinds of cleaning solutions! And now that it's done, don't you wonder why you didn't make that awesome change sooner so you could enjoy it as well? The new look for the kitchen is great! I would really like to have mine looking like that. I have thought about getting a new stove but the oven would have to be built above as my dishwasher is under the burners (stove top). My stove 34 years old and the oven is above (one piece made together). They don't make them that way any more so we would need help. Is Steve for rent? It really is nice, Becky, and I'm sure you and Steve could fix any house in Manteo. You would take the pictures and Steve doing the work--what a team. Have a great time in Floriday.